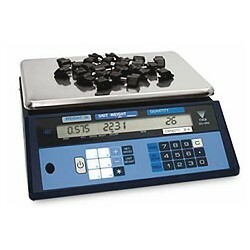 The DMC-688 Series coin counting scale was developed with portability and speed of operation in mind. This efficient model can weigh any quantity of coin in 3 seconds! Weighing only 8 lbs and powered either by battery or AC power, the DMC-688 is ideal for applications that require a portable scale. Preset coin value keys allow you to count everything from a handful of dimes to a $1,000 bag of quarters. Eighteen hot keys allow you to customize the scale with any assigned coin, token, or ticket denomination. Three large bright displays for weight, denomination, and total value feature super high contrast that make results easy to see, even in dim light.